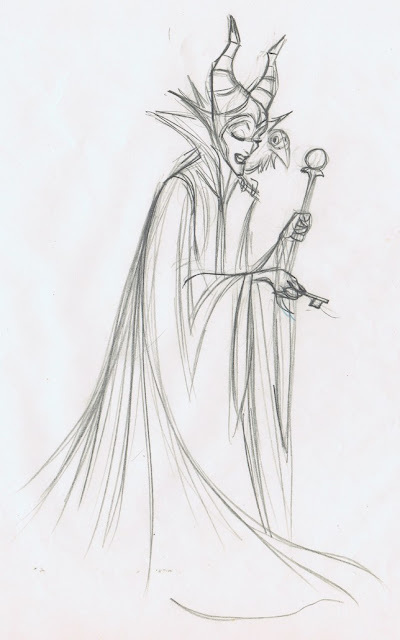 I will be discussing this Maleficent scene by Marc Davis in my upcoming book The Nine Old Men. Most key drawings will be shown in sequence. It is interesting to see how rough this scene is drawn, compared to Marc's drawing approach in his earlier work on the character, which is very clean and tied down. My guess is that by this time in production his clean up crew had become very familiar with the character, allowing Marc to draw loose and get through his scenes quicker. Evil power combined with sophisticated elegance!